"He could not believe we were playing that music in a night club because he couldn't imagine people being able to dance to it. He was wrong." Seymour Nurse at The Bottom End in a very exclusive interview. Seymour Nurse: How did you first get into music, and who were the first artists that you were listening to? Bülent "Boo" Mehmet: I would love to say that I was into Chick Corea when I was in primary school but actually my earliest memories were of buying glam rock records like T.Rex when I was about 10 years old and meeting Marc Bolan's mum on a bus in Stoke Newington, North London where I (and Marc) was born. For me things got really exciting musically when I was about 15 in 1977 and began going to see punk bands like The Clash and The Jam. Also, at around the same time, I was into reggae and saw Dennis Brown at the Rainbow Theatre in Finsbury Park. It might have seemed an odd mix but I suppose I had consciously or unconsciously recognised punk and reggae as both being 'rebel music' as they both spoke about oppression and alienation. This appealed to me because of the politics, the energy and the excitement. S.N: What clubs did you first go to, and which DJs were you inspired by? Global Village in Charing Cross and I was hooked. Monday nights at the Lyceum Ballroom in the Strand was 'Import Night' where you could hear music that wasn't yet released in the UK. Not sure that I was aware of who the DJs were at these places when I first started going but I think the late great Froggy played the Lyceum. Within months I had become very fussy about the DJs and the music and was going to Crackers in Wardour Street where George Power was in session on Sunday nights and Friday afternoons. This was when the music and dance culture of this relatively small, specialised and underground, scene really took over my life. I became fanatical about the music and spent all my time seeking out the best music by going to all the happening clubs but always ending up back at Crackers which became a musical and spiritual home. George Power was a promoter as well as a DJ and was constantly starting up new club nights and we would follow him around. We also went to Gossips, Gullivers, Royalty, Spats/Studio 21, 100 Club, Barracuda Club, Legends, Le Beat Route, Flicks, etc. George Power was my main inspiration as both a DJ and a promoter. I think George was very independent by nature but also did his own thing because he seemed to be excluded from the main big group of DJs on the scene which was headed by Chris Hill and who called themselves the 'Soul Mafia'. Perhaps George was not the easiest person to work with but I still feel it was very odd that he did not get invited into the main group of Soul/Funk DJs considering how much he had advanced the music of that scene especially at Crackers. Also, George should get real credit for the fact that he was putting on club nights in central London that did not exclude anybody. Alternatively, he should get credit for catering for a predominantly black crowd when others could not or would not. There were other clubs where the crowd were predominately black but they were reggae clubs and they were not right in the centre of London. Other DJs who provided inspiration were Froggy and Robbie Vincent. Froggy was technically head and shoulders above anyone else I had seen at the time. Froggy had built up the huge mobile sound system used at the Royalty and he had been to America and seen the pioneers of mixing records live on turntables. In England, in 1978, some amateur DJs were still using a single turntable and even professional DJs with the latest equipment would sometimes be heard struggling to play two records without a gap between tracks. The first time I heard Froggy playing two copies of The Brothers Johnson's "Stomp" at the same time with a delay was a revelation. As a DJ I was never a turntableist (more a 'selector') but I could still appreciate mixing, which was then, a very rare skill. Robbie Vincent was a rare DJ for other reasons. Firstly, he was playing 'our' music on the radio which was amazing. Secondly, he was promoting new music particularly jazz that nobody else had discovered yet. He was a champion of early British 'Jazzfunk' and also Japanese Jazz which he called 'Jap Jazz'. Robbie Vincent was probably responsible for popularising Japanese jazz and Jazz fusion in this country. The first time I heard people like Sadao Watanabe and Hiroshi Fukumura was because Robbie played them on the radio and that's why we would go all the way to Flicks in Dartford to see him. Electric Ballroom was Colin Parnell, and you formed a formidable alliance with him. How did the two of you get together? B.M: Colin grew up in Hackney two streets away from where I lived just over the border in Islington. Colin recently reminded me that we met when he and another friend from his road came over to my flats to play cricket on a grassed area. (We were all about 14 years old at the time and sadly if teenagers did now what Colin did then it is more likely to lead to a serious fight than a life long friendship). Initially, me and Colin had different taste in music but within a couple of years we were into exactly the same stuff and going to the same clubs. With our DJing partnership, I think we had complementary skills which served us well as tasks were split between us in a natural way. I was the technical person managing the sound system and the financial/business side of things. At that time Colin was more sociable than I was and built relationships with the major record companies which got us onto their mailing lists. 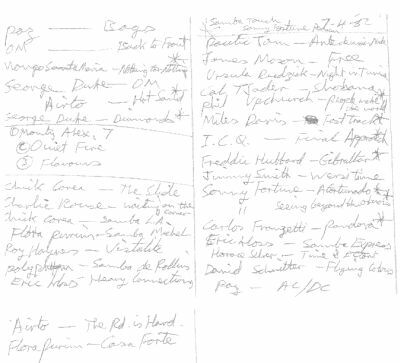 The musical side was also complementary in that we developed separate sources for records and pooled them into a single collection representing maybe a wider range than it would have individually. Throughout this interview I refer to 'we' (meaning me and Colin) and that just reflects how closely and seamlessly we worked together. This sort of close collaboration is common for modern day DJ/producers but back then was more unusual as there was a lot of back stabbing in the seedy world of club DJs. S.N: How did you get into DJing? B.M: I think I just wanted to spread the word by playing the music I loved. So me and a friend called Serge (who I met through Colin Parnell) got together when we were 16 and bought a second hand 'Disco console' which was two belt drive turntables and a mixer/preamplifier built into a wooden coffin type console. We then bought a power amplifier and speakers and soon after that our mutual friend Colin joined us in building what was called a sound system which was basically a mobile disco. 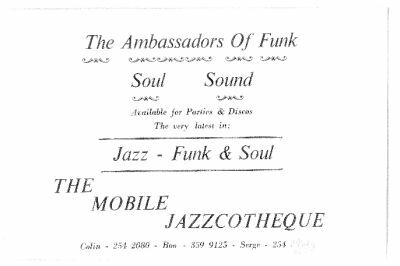 That was the beginning of the 'The Ambassadors of Funk Soul Sound' later also known as 'The Mobile Jazzcotheque'. We played at house parties and college discos but we were very choosey about what gigs we took on because we would only play the music we really liked. I think we quickly got a reputation for having the latest sounds (Soul, Funk and Jazz) and particularly for playing what were considered 'hard' tunes. For example we had the debut albums, on white label, from Freeez, Atmosfear and Incognito which were very Jazzy for the time. We also had the latest American imports and were always scouring the shops all over London for rare jazzier records that the top professional DJs had. The initial records of the sound system came from pooling our personal record collections. Me and Colin continued this pooled collection idea by buying records separately from different sources then putting them together so we both had access to the same collection of records. This made complete sense given the cost of imported records and the cost of the equipment for the growing sound system. This enabled our reputation to grow quickly. Even when we were working as DJs without the sound system we maintained a combined record collection which was still largely subsidised by our day jobs as there was little money in DJing in the specialist underground scene that we were in. S.N: You played in the Jazz Room at the legendary "Jazzifunk Club" at the Horseshoe. How did you make the connection with George Power? B.M: We were devout followers of George Power at Crackers and all the other club nights he started and had been following him around for a while and so he got to know us. We saw our natural audience as the sort of people who went to these clubs and where we grew up musically speaking. We were faces on the scene and our friends and acquaintances helped build up our profile as DJs. George got to know about what we were doing although he was pretty hesitate when we indicated that we wanted to work with him. 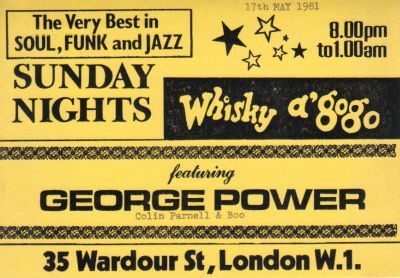 I think the first central London club we played at was with George at the 'Whisky A Go Go' in Wardour Street (later called the WAG club). 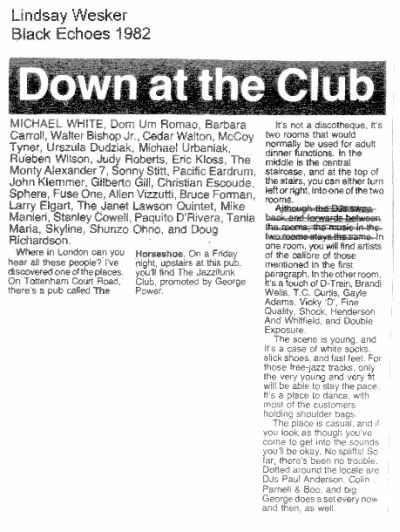 This was on the 17th May 1981 just three weeks before George's 'Jazzifunk Club' at The Horseshoe opened. 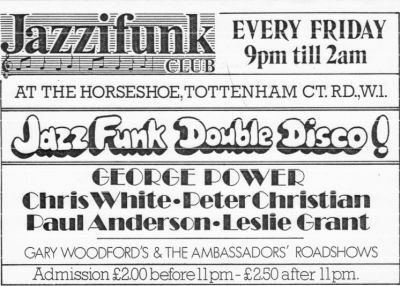 The Jazzifunk club was George's promotional company that had been going for a while and he had used this name at a few clubs before the Horseshoe. I was in fact an early Jazzifunk Club member (membership card number 13) and was receiving promotional mail outs in the post from George! George was very innovative in coming up with the concept of what he called a 'Double Disco'. Having separate rooms playing music in the same venue at the same time became common place much later but in 1981, in the West End of London, it was unique. It is important to know that The Horseshoe was not a purpose built night club. It was two very large function rooms and a separate large bar room on the first floor of what was The Horseshoe Hotel in Tottenham Court Road next to the Dominion Theatre. So this empty space, usually used for weddings and other functions, had to be transformed into The Jazzifunk Club every Friday night. This meant George needed to bring in two separate mobile sound and lighting systems and the right DJs to make this work (which is where we could offer him a package deal of sound system and upfront DJs!). He also needed to attract crowds of about 600 or more so that all this space did not look empty. Remember that there were no super clubs yet and central London clubs were often pretty small especially ones playing this sort of music. So this was an ambitious venture at the time. We wanted to DJ at The Horseshoe but George did not think we were experienced enough to headline. However, he did want to use our sound system. 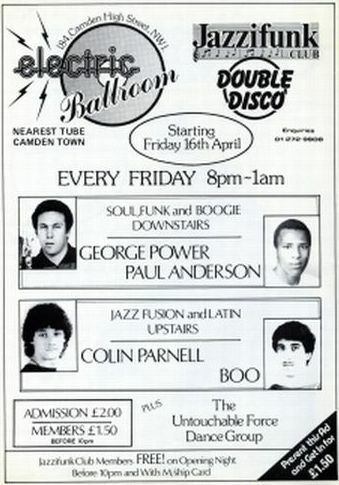 So although our 'Ambassador's Roadshow' was on the bill me and Colin were not on the original bill as DJs when the club opened on Friday 5 June 1981. We warmed up for Chris White and Peter Christian. This changed just one week later when the Jazzifunk Club Jazz Room became the exclusive preserve of me and Colin. Nobody told us what we were expected to play. We just played what we wanted and it worked. George was happy because the crowd were happy and he never questioned the musical direction we took which was probably not what he expected before The Horseshoe started. S.N: What was your experience like playing in that Jazz Room at the Horseshoe? B.M: It was incredible and pretty unique. Firstly, we were playing heavy jazz/jazz fusion all night long - non stop. Secondly, we had a crowd of probably 300-400 people just in this room dancing to this music all night - non stop. Before this club it was assumed that jazz was very much a minority interest within the soul/funk/Jazzfunk scene which itself was not that big. So the rules that DJs had in other clubs was to only play a few, relatively dancer friendly, jazz records then get back to the funk and soul so as not to alienate the majority who could not dance to fast paced jazz records. Although Paul Murphy already had a jazz club (called JAFFAS) based at the Horseshoe on a Saturday night he never had the numbers of people we got week in week out at the Jazzifunk Club's Friday night. 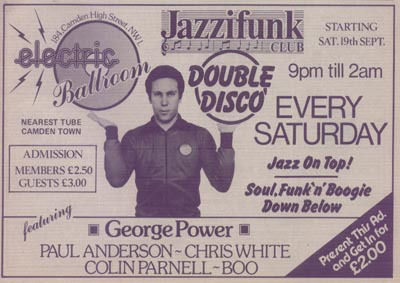 What helped us was George's 'Double Disco' concept because people who may have initially been too intimidated to attend a single heavy jazz club night could attend and alternate between the two rooms at the Jazzifunk Club and be part of both scenes. At the same time those people who wanted to dance to heavy jazz all night long were now able to do that in a big central London venue instead of being confined to some dingy out of the way basement club. This exposure to jazz increased the size of the crowd coming in and the amount of time they spent in the Jazz room. This in turn increased our confidence to play more and more adventurous jazz. I was surprised to learn that the reason why I sometimes did not recognise some of the faces in the Jazz Room was because there were regular coach parties coming all the way from Birmingham and other places just to experience the vibe and to dance. S.N: Where you playing anywhere else during this period? B.M: Me and Colin continued to do some private events but most other gigs were with George (Power). We did one-off all nighters with him and also there was a period where we were playing the Electric Ballroom on a Saturday and a club in Piccadilly called 'Planets' on a Sunday. This was at the same time as the Horseshoe on Friday nights. This was before moving to the Electric permanently on Fridays when the Horseshoe lost its licence. S.N: What are your memories of the dancers and battles at The Horseshoe and Electric Ballroom? B.M: I remember that the size of the Jazz room at the Horseshoe allowed everyone who wanted to dance the space to do so. A normal night club was mostly carpeted with a wooden or glass/plastic 'dance floor' area, which was often quite small relative to the rest of the club which had seats and bars and other smaller separate areas. Anybody wanting to dance on the actual dance floor, say at Crackers, had to be pretty good because it was a small space and therefore only had room for the best dancers who would challenge, usually in a friendly way, any 'amateurs' who strayed onto the dance floor proper. By contrast, the Horseshoe Jazz room was a great big rectangular room with an entirely wooden floor so the whole space was a dance floor. Everyone in the room could dance without feeling they would be open to scrutiny by putting themselves on show in the centre of the dance floor. The dancers I remember were mostly the people I got to know from Crackers and other clubs who then made the Horseshoe their home. I particularly remember Richard Baker, John Reilly, Michael Brown and his friends (who went on to form the group The Pasadena's). Richard Baker and John Reilly together with Simon Mbelu and Danny Carter became 'The Untouchable Force' dance group. We helped them get their first gigs which were at the Horseshoe and Electric Ballroom. They were inspired to form a dance group by 'Torso' the first dance group I remember (which included legendary dancer/DJ/model Trevor Shakes). In terms of battles, I do not remember there being anything more than friendly rivalry among the dancers at the Horseshoe even when coach parties came down from Birmingham and other places. When we moved to the Electric Ballroom things started to change and became more intense and less friendly. This was probably because the Jazz room at the Electric was much smaller and dancers were competing for space to dance. This meant you had to be really good and assertive for others to concede space for you to dance because space was not available. I have since heard that things got more aggressive on occasions in the Jazz room between some of the dancers after I left. S.N: Trevor Shakes deserves all the praise and recognition that is given to him, for he truly is a legend. You made a very good point here, relative to how and why the Fusion dance form evolved at the Electric Ballroom, and became more dynamic, for the dancers were literally competing for space, and had to up their game and incorporate more effective battle moves in a tenser environment. Did you feel that you started pushing the boundaries of Fusion in relation to the dancers, and what were you looking to establish with them on the dance floor? B.M: I do not remember ever discussing the musical policy of the Jazz rooms (at the Horseshoe and the Electric Ballroom) with George Power the promoter. We just played what we liked and the dancers liked what we played. Me and Colin had no great plan to 'push boundaries' but that is what we found we had done in a very short space of time. The interesting thing is that I am now not sure that George actually intended on having a hard Jazz room at the Horseshoe. We were not on the bill for the opening night and the flyers described the club as a 'Jazz Funk Double Disco'. There was no mention of a different music policy in each room (unlike our billing for the Electric Ballroom). 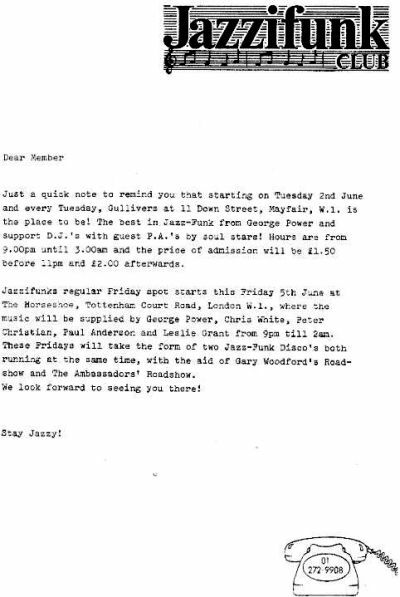 Also, as a Jazzifunk Club member I received a letter from George promoting the opening of the Horseshoe which said 'These Fridays will take the form of two Jazzfunk Discos both running at the same time'. Again, no mention of having very different music in each room. So I think it was me, Colin and the dancers who simply made the room what we wanted it to be - the first, successful, no compromise, hard Jazz room. There were a few incidents that really brought this home to us. 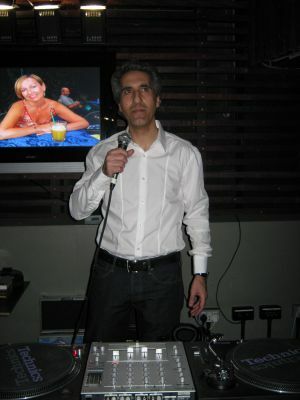 The first was when George came into 'our' 'Jazz' Room to do a spot on the decks. This was just a few weeks or maybe a couple of months after we started at the Horseshoe. Things were quite settled at this point with George and Paul Anderson playing exclusively in the Soul, Funk and Boogie room with me and Colin playing exclusively in the Jazz room. So I don't know why George wanted to come into the Jazz room to play. Maybe he felt he could offer some variation on what we were doing or maybe he wanted to re-confirm the reputation he had at Crackers as the main DJ who played Jazz. Anyway, he started playing his records and pretty soon the crowd at the front, the top dancers, just stopped dancing which meant everybody else stopped dancing too and people were just milling around. I was shocked. There was nothing wrong with what George was playing but I realized that we had moved things on, musically, to such an extent that the crowd would not accept the sort of jazz that George had been playing at Crackers just a few months earlier. I was embarrassed for George who just laughed it off and said jokingly 'dance you bastards, dance'. He never came into the Jazz room again. Another incident was when a record shop owner passed on a comment made by a northern DJ about me and Colin. At the time Blues and Soul magazine and Black Echoes newspaper would publish charts, sent in by DJs themselves, listing the records that were going down well at their own clubs. This DJ in the record shop could not believe that we were actually playing the records shown on our charts at the Horseshoe. He thought that we were posers making up our charts. He could not believe we were playing that music in a night club because he couldn't imagine people being able to dance to it. He was wrong. Our dancers were pushing the boundaries on a weekly basis and we were encouraging them by playing stuff never previously heard in a 'disco'. 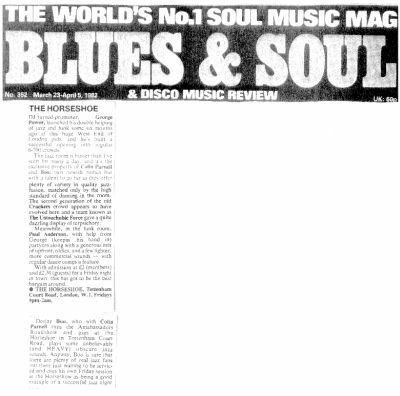 Also, when the journalist Lindsay Wesker came up to the Horseshoe and wrote an article for Black Echoes newspaper he was so astonished at what we were playing in the Jazz room that nearly half of his article was simply listing some of the artistes he heard us playing. (He also said the DJs swapped rooms which was incorrect. A Blues and Soul review (correctly) described the Jazz room as 'the exclusive property of Colin Parnell and Boo'). S.N: You have reconfirmed what I have been saying for years regarding what was happening in the South, and the 'pure' hard jazz rooms that were in full effect in 1981. 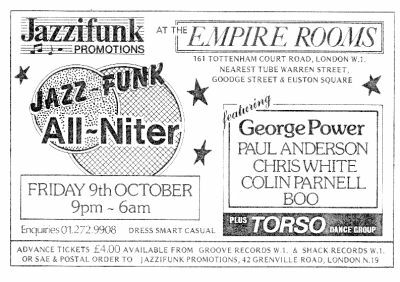 You and Colin then became the first Electric Ballroom Jazz DJs when the Jazzifunk Club changed venues. How was the transition from The Horseshoe to the Electric Ballroom? B.M: The crowd from the Horseshoe followed us to the Electric and the Jazz room was successfully re-established there. However, for me personally there were a number of problems. Firstly, The Jazz room at the Electric was very small and carpeted. Paul Anderson were playing Soul, Funk and Boogie. I declined as I felt this would be a backward step to the time before the Horseshoe when you could only play a few jazz records at a time and even then your choice of jazz would be compromised by trying not to put off those people who were only there for the Funk and Soul. Anyway, the basic issue was the size of the Jazz room and there was no solution to that problem. Secondly, a few weeks after we started at the Electric, Colin became debilitated with a serious eye problem and was quite ill. So I carried on doing the Jazz room, playing for about seven hours each night, on my own for about two months. S.N: I do remember the carpet before they put the wooden floor down in the Jazz room. There were occasions when the lights came on at the end of the night, and the denim on dancers knee caps were gone from the floor moves. I guess that is pure love and passion for dancing... You were at the Ballroom for a relatively short period. Why did you decide to leave the Jazz Room? B.M: The short answer is I got tired of it. I still loved the music and the connection with the dancers but the business side of working in nightclubs at that time had worn me out. Things were difficult for me personally since the Horseshoe days and you can only put up with stuff for so long. Eventually, doing something just for the love of it is not possible when it takes so much of your life and energy. During the week I had to maintain the equipment when we were at the Horseshoe and, along with Colin, spend all my time sourcing the records. We both had full time day jobs which were needed to subsidise the cost of the records and equipment. There were issues with George as well since he wasn't easy to deal with and Colin left that to me! The transition from the Horseshoe to the Electric was problematic and I could not see any way to resolve those issues so after a few months I said I didn't want to do it anymore. It was an impulsive decision made at one particularly difficult night at the Electric. In retrospect I can see that it was inevitable because the situation was not sustainable - you can only do something purely for the love of it for so long. S.N: Paul Murphy replaced you at the Ballroom, and fully established himself there creating quite a legacy. How was your connection with Paul as a DJ and Record Dealer? B.M: I went to see Tania Maria at the YMCA when Paul brought her over. I didn't go to any clubs Paul Murphy played although I was well aware of what he was doing and he certainly made a contribution to the jazz scene in a number of ways. 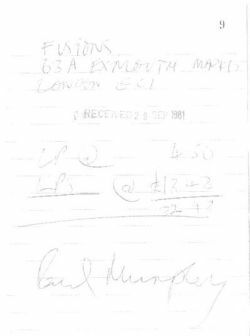 I did go to Paul's record shop but this was only over a period of six weeks between the 29th September and 10th November 1981. I can be so precise about this because I still have the receipts! (Me and Colin used to buy records separately then pool them in our joint record collection so I needed to keep track of our purchases so that we could settle up). Some saw us and Paul Murphy as rivals but from what other people have told me he didn't really get a big crowd at his clubs when he was DJing prior to the Electric. When I left the Jazz room at the Electric George knew that Paul was the only person who could potentially step into our shoes which he did. But the Jazz room at the Electric was already established when Paul was brought in and this was the legacy of the Horseshoe which me and Colin had created. I think maybe if we had all been a bit older or more mature we could have become friends with Paul and pooled our ideas and meagre resources in the interests of our mutual love of the same music. 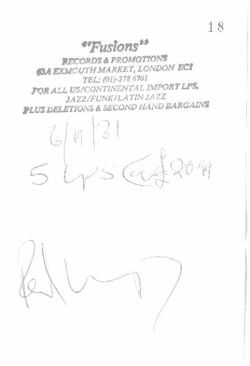 S.N: I was buying 'dance floor' jazz from 12 years old, and my collection was heavily influenced by what you and Colin was playing, as my older friends were going to your early sessions and passing on the music information to me. Snowboy in his book, 'From Jazz Funk & Fusion to Acid Jazz. The History of the UK Jazz Dance Scene' (2009), described your playlist as 'out of this world'. 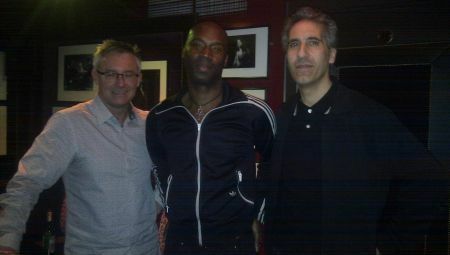 The legendary Jazz-Fusion dancer Milton "The Ballroom King" McAlpine named you and Colin as his favourite Jazz DJs. Where did you get your records from? The rest our record collection came from a variety of places including: Fame Records of Oxford Street run by Peter Christian who used to DJ with George Power; Record Shack of Berwick Street; Groove Records of Greek Street; OBJs in Dalston Waste market; Colin's cousin in New York; Record company mailing lists; and various HMV/Virgin/Our Price Records. S.N: You have been quite elusive over the years giving me a DJ "Holy Grail" to track down. What have you been doing since that period, and are you still connected to the music? B.M: The short answer is that I have been an accountant for 20 years and have only recently reconnected with the music scene. After the Electric Ballroom me and Colin did organise and promote a few one-off gigs but it didn't seem possible to set up anything regular in Central London. I remember us having good meetings with club owners and managers when we presented our ideas for club nights but they went cool on us when they found out what sort of crowd we would be attracting. I am sure that their own prejudices had a lot to do with this (it was common in those days for clubs to routinely restrict entry to black people - Seymour Nurse documents his own experience of this and I have read that when Paul Murphy left the Electric Ballroom for the WAG club his followers could not get in there and had to go back to the Electric). The other problem for club owners was purely commercial - they made their money over the bar and our crowd were not drinkers. It felt like we were boxed into a corner by the music we loved. It was seen as too underground, too urban and, for many club owners, too black. This was before the explosion in pirate radio stations which created new opportunities for many DJs when legal radio stations were not interested. It was also before DIY ethic of the warehouse party scene. So it seemed there was just nowhere to go with the music we wanted to continue playing. I think we were born just a few years too early! I do have huge respect for anybody who persevered with the trials and tribulations of the early 1980's club scene but I can think of very few DJs who were playing when we started and are still going successfully today (Norman Jay, Paul Anderson and Pete Tong are exceptions although none are Jazz DJs). So after about five years DJing I concentrated on my day job for 2 or 3 years until 1987 when I decided to go to university. I did Economics at the London School of Economics which is where 'Judge Jules' did Law at around the same time (we never met!). I then worked in Government where I trained and qualified as an Accountant. I have also worked in property investment and management. During 2007 there were a number of events that triggered echoes of my DJ past. In my job I had spent four years managing the finances of a 16 million pound construction project to build a new theatre and arts centre in Seven Sisters, Tottenham, north London. This is a state of the art bespoke facility designed by world renowned architect David Adjaye and named in honour of the late Bernie Grant MP. When 'The Bernie Grant Arts Centre' (BGAC) opened I saw a performance there which simply blew me away. The show was called ... 'Legends of the Underground'. The dancing and the music had echoes of the music and dancing I remembered from the Horseshoe/Electric but obviously expertly and professionally choreographed and presented with state of the art graphics (in 3D!) on a big stage. It was a while later that I found out the history of the people responsible for that show, Gary and Seymour Nurse, and how they and others had taken the music and dancing I had known and developed it professionally over more than 25 years. I had missed all that but had now seen a glimpse of it purely by chance. At around the same time I was looking through the records in a shop and came across an album released the previous year (2006) by Gilles Peterson called 'Sunday Afternoon at Dingwalls'. I got a shock when I read the sleeve notes and saw that Gilles had described me and Colin among his 'teachers' and as 'true pioneers of today's alternative club culture'. I really had no idea that anybody cared about or even remembered the Horseshoe/Electric ballroom Jazz rooms that me and Colin had established all that time ago. Next came a request from one of the managers at the Bernie Grant Arts Centre for me to do a DJ spot on an open day they were having! Apparently one of the staff there used to go to the Electric Ballroom and knew my history. So I played music, some jazz, some soul, some newish stuff, to an audience for the first time in 22 years. Over the past couple of years I have played at various public events at the BGAC and at a couple of private functions as well. I started by playing vinyl but I quickly learned to use Pioneer CDJ 1000s. I am also using digital DJ software (Traktor). I have been enjoying playing a mixture of stuff, new and old including Jazz but have not yet done a full on pure jazz gig. 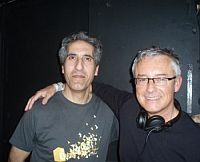 However, this week (Friday 19 November 2010) I will be spinning some Jazz at the BGAC with Jorge Montiel who is a DJ, producer and co-founder of a fantastic funky jazz band called Los Charly's Orchestra. I came across Los Charly's when I heard their debut album released a few months ago. They are a great group of musicians who have a real quality old school jazz/latin/funk sound and I am looking forward to supporting them. Thank you for your feedback regarding our 'Legends of The Underground' project. I had no idea that you were at the show until recently. The magical synchronicity is that Andy Dyer (another original "Jazzifunk Club" Jazz Room DJ at the Ballroom that played there years later) was also at the Bernie Grant Centre that day, and brought his children to see the earlier daytime show. I paid him my respects during the question and answer session, and made a reference to the Electric Ballroom. I would have brought you up on the stage if I had known that you were there during the evening performance. Which tracks would you name as your Top Ten "Jazzifunk Jazz Tunes"? B.M: A quick think about this question throws up 20 or 30 tracks but if I had to settle on just ten then let it be these [in alphabetical order (not ranked)]. 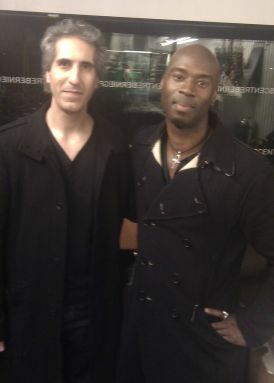 S.N: Thank you so much Boo for this interview, and your priceless contribution to the Jazz Rooms and our Fusion Dance/Club history. B.M: 'Until relatively recently I had no idea that anybody cared or even remembered what we did at the Horseshoe and Electric Ballroom so I'm really happy to share those memories with you now. I am also really happy to be reconnecting with the music, both old and new, and to be DJing again'. Best wishes, Boo.